Jurgen Klopp is confident Dominic Solanke's development is on track despite a lack of first-team football at Liverpool. England Under-21 striker Solanke moved to Anfield from Chelsea last season but only managed five Premier League starts and a solitary goal, while he is yet to feature in a matchday squad this time around. Nevertheless, having been a standout in the youth ranks for his country, the 21-year-old remains on the radar of national team boss Gareth Southgate. Solanke was invited to train with the senior England squad during the international break and Jamie Vardy's retirement from Three Lions duty leaves him higher up the pecking order than a player given such sparse competitive action might expect to be. Game time for England's brightest young talents has become a topic of increasingly heated discussion over recent weeks, with Manchester United manager Jose Mourinho reeling off a string of statistics on Friday to demonstrate his frequent use of Marcus Rashford. During that news conference, Mourinho compared the first-team exposure granted to the likes of Solanke, Ruben Loftus-Cheek and Dominic Calvert-Lewin unfavourably to Rashford. While Klopp concedes the current state of affairs is not ideal, he maintains Solanke will be given chances to progress. What a strike this was! "It's not a perfect situation, that is clear," he said. "He is a young striker and a young striker generally needs longer in a big club, that's how it is. "If you're a young striker at another club and you don't perform and you don't score then it can be career-threatening because no-one in this world is patient enough. But it is all fine for Dom. "He didn't play as often as he wished but he is still developing and still improving. He had good games last season, not enough minutes that is true, but he is still young and when we cannot use him as a striker we still work with him. "We work with him to try and fulfil his potential and I think we are really on a good way with that. " Klopp's men take on Tottenham at Wembley on Saturday and he believes Harry Kane serves as a fine example to Solanke. England captain Harry Kane bided his time at Spurs across a succession of lower-league loan spells before graduating to the realms of Premier League and World Cup Golden Boot winner. "If he works hard then everything will be fine because of his talent and his skills," the former Borussia Dortmund boss added. "I don't know exactly where Harry Kane was at the same stage of his career but he was all over the country playing and not playing. "I remember a picture of Harry Kane and Jamie Vardy sitting on the bench for Leicester. They obviously didn't start that day but they made their way. "It is really difficult for strikers to get the one spot or one of the two. We are still 100 per cent sure everything will be fine for Dom." 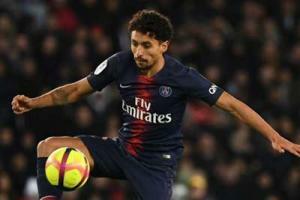 Paris Saint-Germain face Rennes in the Coupe de France final on Saturday and Marquinhos thinks defeat will ruin their season.